Leading ventilation supplier CVC Direct has advised anyone specifying an MVHR (mechanical ventilation with heat recovery) system to understand the basics of relative humidity and consider their own local climate before choosing a system with an enthalpy heat exchanger. NIBE’s F730 exhaust air heat pumps have been selected to provide heating, ventilation and hot water for the Bolands Quay apartment development at Grand Canal Dock in Dublin, which is currently under construction. One of the key elements that influences choice of mechanical ventilation with heat recovery (MVHR) units is specific fan power (SFP), says leading MVHR supplier CVC Direct. The basic principle of the passive house standard is to reduce energy demand, and SFP is a key indicator for measuring the energy efficiency of the MVHR unit. The lower the SFP, the more efficient the system. Leading mechanical ventilation with heat recovery (MVHR) manufacturer Brink Climate Systems has launched a new high efficiency MVHR unit, the Flair 325. According to the Dutch company, the new range comes with some exciting new technologies to boost efficiency, ensure correct ventilation rates and enable easy operation. The Dutch company Fresh-r has won the passive house components award at the 22nd annual Passive House Exhibition in Munich, for its decentralised residential ventilation system. Fresh-r worked together with the Scottish firm Collective Architecture on its submission for the award, which was presented at this year’s international Passive House Conference. Leading ventilation manufacturer Airflow Developments has added variable air volume (VAV) dampers to its Duplexvent range of commercial mechanical ventilation with heat recovery (MVHR) units. The VAV systems constantly monitor the air volume supplied and share this information with the ventilation unit. As such, the systems ensure optimum air quality and comfort by allowing the ventilation to respond effectively to the demands of each area of the building. Investing in heat recovery ventilation units without paying due attention to distribution systems may risk undermining energy performance and indoor air quality, a leading ventilation expert has warned. Leading Irish heating supplier Origen Energy has launched the Genvex Combi 185 combined heat recovery ventilation and domestic hot water heat pump to the Irish market. The digital versions of all previous issues of Passive House Plus are now freely available online. The magazine is available in entirety in digital form, while many of the feature articles are also now available in HTML form - or in other words as regular web articles. The digital editions use the Issuu pageflipper software, which was chosen for its functionality, simplicity and the ability for readers to interact with magazine content - for instance by sharing links to articles in the magazine via social media or email, or by clicking links to websites contained in articles and adverts. A new development in Tipperary aimed to combine excellent levels of airtightness and insulation with generous glazing and natural ventilation to deliver ultra-modern, comfortable, low energy offices. How did it work out? 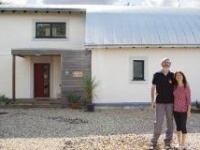 For Ruth Busbridge and her builder Mike Whitfield, aiming for the passive house standard was just one part of an environmentally conscious approach that put natural, healthy materials to the fore. 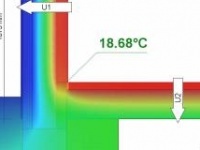 Natural ventilation - does it work? based on robust, comprehensive evidence. But how does natural ventilation fare when subjected to the same degree of scrutiny, and can it work in low energy buildings? The Burnham Overy Staithe development in North Norfolk picked up a prestigious UK Passivhaus Award in October, and is profiled in depth on page 28 of the new issue of Passive House Plus. Energy efficiency expert Mark Shirley of 2eva.ie has just completed a whistle stop tour of ISH in Frankfurt, one of the world's largest building industry expos, where he found passive house solutions featuring heavily amonst the heating and ventilation solutions on offer. Government incentives are crucial to sparking a massive energy upgrade of our housing stock, but practical examples are just as important. 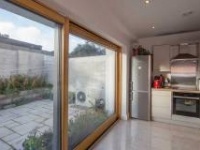 Keen to push his home's energy performance to the limits, one Dublin homeowner overhauled his entire building fabric and installed renewable heating systems and heat recovery ventilation. Lenny Antonelli visited the house. 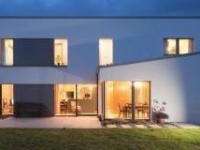 Construct Ireland’s John Hearne discovers a low energy, low carbon house being built in Galway which is achieving sustainable results whilst not jarring with aesthetic conventions. The Dwelling Energy Assessment Procedure (DEAP) is now the national methodology for creation of Building Energy Rating (BER) Certificates for new dwellings in Ireland, and is an important desk top tool for predicting the performance of projects at outline design stage.